The Kool Stop Salmon offer a rim friendly compound. 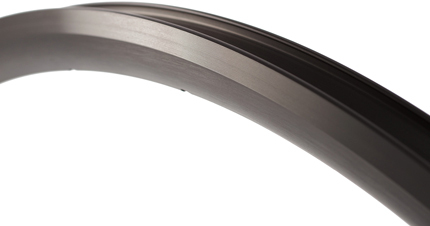 Hard anodised reduces the rate of surface braking wear much like ceramic coatings. As this compound was designed for ceramic coated rims, it should perform in all weather conditions. You can definitely run 23 mm tyres! Hi, The hard anodised will last a bit longer, but ultimately will wear off in time.